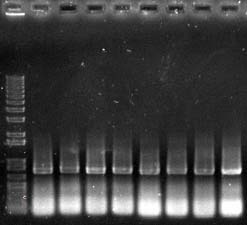 Even every band in the ladder is doubled, so it is definitely a problem with the electrophoresis itself. I'm not sure why this is happening. I've tried a few different things such as different volumes of buffer in the tank. I never used to have this problem and have never actually noticed this issue in years, but I keep getting it fairly frequently and it's just ugly... Any suggestions on the cause? I recent started using TAE, and the appearance of these doublets may be correlated with when i started using it, but i have definitely gotten clean gels when using TAE. I don't think this is an electrophoresis problem. The gel is overloaded, which can cause the smearing. I think there really is a small amount of a longer fragment, along with massive amounts of very short DNA. Is this a PCR reaction? You could be seeing primer-dimers along with a desired product. I am indeed seeing primer dimers along with the desired product, but that's not the point. The ladder on the left is not overloaded and there is still the band doubling effect. the resolution of the picture is to low to tell for sure but it looks like the wells have not been formed cleanly. you should ensure that the agarose has completely gelled (and cooled) before removing the comb and that you flush any bits out. also, make sure that you straighten the wells after removing the comb (suction may make the walls collapse (or partially collapse) into the well when removing the comb). when it appears that you have double bands it is usually caused by the sample starting migration from two different points.